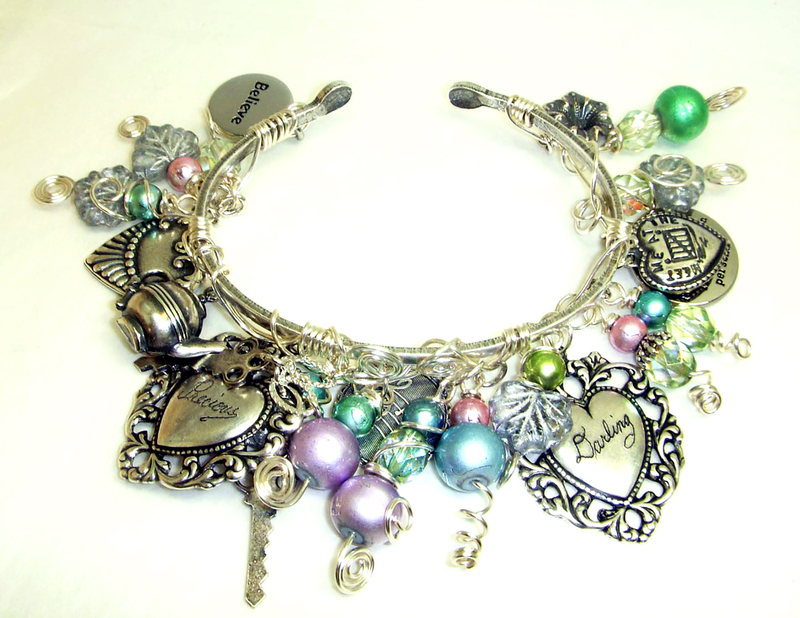 It's Time For the 5th Annual B'sue Boutiques Workshop! The event will be held May 17-19, 2019 at The Dutch Haus Inn in Columbiana, Ohio, which is located 45 minutes west of the Pittsburgh International Airport. 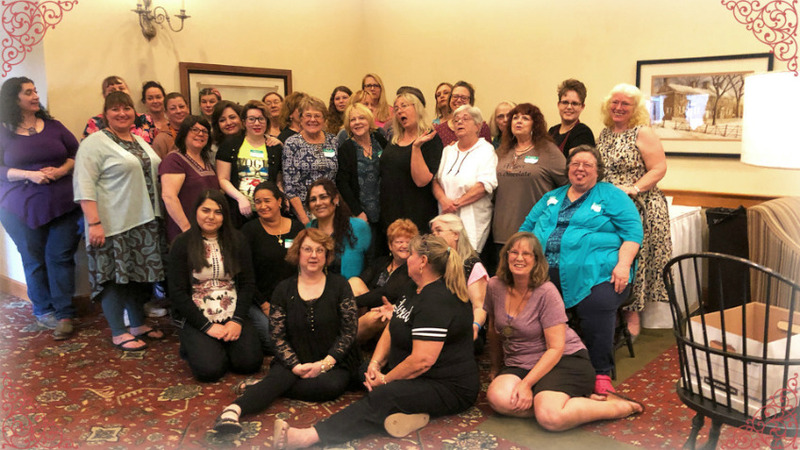 This year it will be three long days of joyful mixed media jewelry making in the B'sue style....which is all about the learning, and all about the fun, too! You can see from last year's group picture what a crazy good time we had, and we expect to have a great time this year, too. 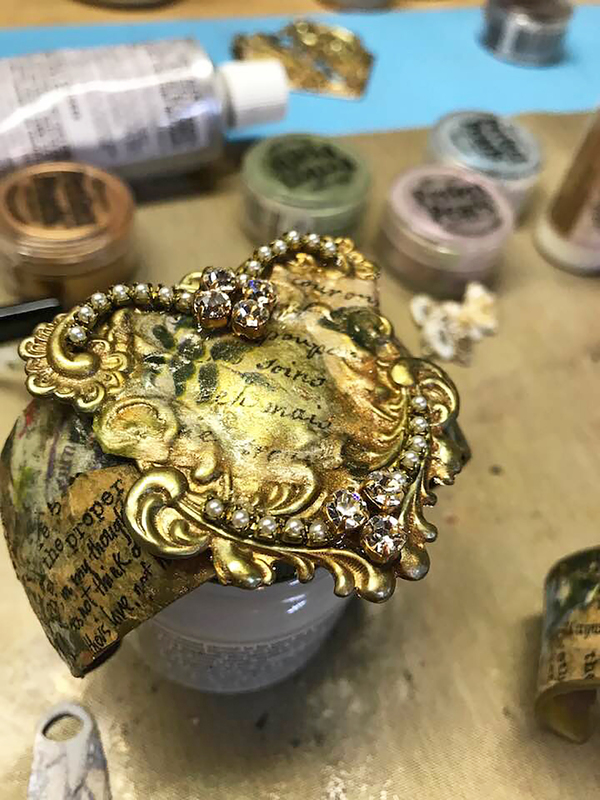 The classes will be about tissue decoupage (cuff photo) wonky wire wrap jewelry (see the bracelet picture) and kitchen sinker necklaces (see the necklace photo). These are things I've taught in my YouTube videos and are some of the favorite videos among the over 210 I've made. 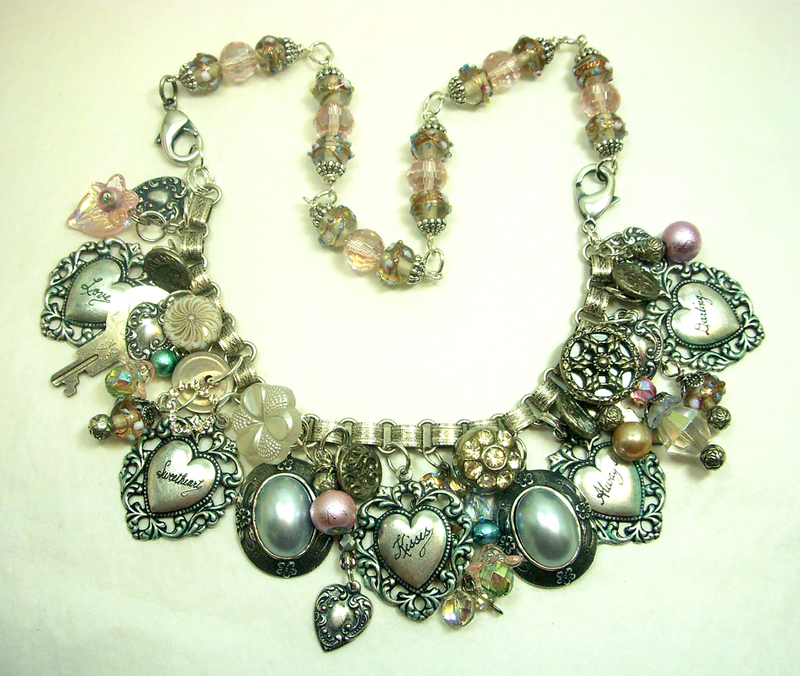 Mixed media jewelry makers love these techniques because they are easy, and the sky is the limit. It's so easy, to begin with, one of my techniques and go on to do even bigger and better things as you open up your creativity to the possibilities! The class will begin at 10 am and end at 6 pm with a lunch break at midday. I will keep the workroom open until 9:30 pm on Friday and Saturday nights so everyone who'd like to can come back and play some more! Sunday night we have our group party with our traditional cake, and open house sale, as I always bring some extra goodies to share. If you live in the area and are not able to attend the workshop but would like to come and say hello and have cake with us on Sunday evening, we start about 7:30 and go until around 9:00 pm. There is no charge to pay us a visit at the party on Sunday night, and we'd love to visit with you. The cost for the three-day workshop is $285.00 payable at the time you register by Visa, MC, Discover or PayPal invoice. PayPal has some payment options you can explore; you can break your fee up into payments at Paypal when you pay the invoice, or if you have PayPal Credit, you can use that when you pay the invoice, too. The hotel has a block of rooms reserved for attendees, and you will need to reserve your room after you register and pay your class fee. You can contact me for more details at (330) 886-0052 and you can reach the hotel at (330) 482-5050. There is a Facebook page for an event group, I open it every year in anticipation of the workshop. You should visit it and ask to join. https://www.facebook.com/groups/433039766864451/ Here you can see who all is coming, a network for a roomie, see all the latest details as well as the tool/supply lists for the projects. The event will be providing you will some of the items you will need but there are things you'll want to bring, too, like your fave pliers and cutters. If you don't have favorites, we have some! ONE PERSON THIS YEAR WILL WIN A GIFT CERTIFICATE which is the VALUE OF THEIR WORKSHOP FEE.....$285.00, spendable at the website only The winner will be chosen by random drawing. Just another reason you want to come! Come join us at the Facebook group or call me (330) 886-0052 for details or if you have questions! Hope I'll see you there!